Chidinma Inspirations: Singled Out For Unmerited Grace- DIVINE FAVOUR! Singled Out For Unmerited Grace- DIVINE FAVOUR! 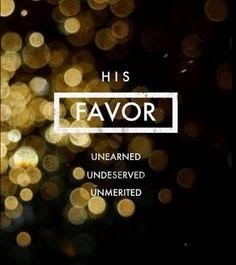 Favour also means an unmerited grace. TheFreeDictionary.com defined grace as something that is "seemingly effortless..." Oxford Dictionaries defined grace as "smoothness and elegance of movement. Now it is safe to define Divine Favour as being singled out by God for an unmerited grace. Being singled out by God to show you kindness for something you didn't work for. It's safe to say that Divine Favour is a form of approval or kindness been shown to you in ways you do not understand I.e. It is a mystery to you (Divine). Remember that God is a mystery. God does things not for us human to understand but for us to give Him all the glory. One thing about God is that He knows and has seen tomorrow even before tomorrow came. Certain things happen for God's Will to be done. Certain circumstances/situations/events takes place in our lives because God made them happen and He needs those things to happen to do that which only Him can do. God's timing is never ever wrong. God might not be early but He is never late. 1) Saul- Saul (King Saul before he was crowned King) was sent by his father to go look for their lost sheep. He and the man who followed him went a little bit far from home in the process of looking for their lost sheep. Meanwhile God was directing Saul's foot steps to meet Samuel (The Prophet). Before Saul got to the place where his path & that of Saul will cross, God had already revealed to Samuel the day before that day by a certain time tomorrow, a certain young man will come here, do anoint him as the King of Israel. Saul didn't know any of that. To the best of his knowledge, he went in search of his father's lost sheep. Immediately Samuel saw Saul, God told him, this is the man I told you about (I Samuel 9). After Saul became King, he didn't really have a strong relationship with God. He always communicated with God through the prophet, Samuel. He never really had a one on one relationship with God. His disobedience to God was so grave that God regretted choosing him as King. Divine Favour! Divine Favour comes in here in the sense that, there were men who were more spiritual/holier than Saul or who were more capable of being chosen as King but God favoured Saul. God singled him out among all the men in Israel to be King. 2) Esther- The story of Esther is strange and mind blowing. . This our God is a God of mystery. Esther was in her house going about her business meanwhile God was in the palace busying preparing the throne for her. God was in the palace busy working in Esther's favour. The Queen of Perisa's misbehaviour cost her, her throne and gained Esther the throne. Esther in a million years might not have thought that she will be a royal not to talk of the wife of the most powerful man in the land, the King. There were many virgins who auditioned for the post of the Queen of Perisa however, Esther was singled out amongst many to be the Queen of Persia. And through her, her people were saved from destruction (The Book of Esther). Divine Favour! 3) David- the story of David is intriguing. He was only but a shepherd boy. A boy his family saw as not suitable for anything but to only take care of the family's sheep. Unknown to them that in the process of him taking care of the family's sheep, God was training Him for the throne. ''For every tear comes a smile, for every pain comes strength. God trains a man before He showcases Him to the world'' (Chidinma Inspirations, 2014). God singled David out of his father's 8 sons who had the "bodies of Kings", the "training of Kings" or" the grooming of Kings". But God singled David out. God chose a man/boy who had the heart of a King. One thing about God is that, His ways are not our ways (I Samuel 16). The way He sees things are far different from the way we see things. God qualifies whomever/whoever He chooses to qualify not whomever/whoever men chooses to qualify. God blesses/favours whomever/whoever He chooses to bless/favour not whomever/whoever men chooses to bless/favour. Among all the eligible men, well groomed men, well trained men in Isreal to be King, God chose a shepherd boy. Divine Favour! EBUBE DIKE! THE GOD OF WONDERS! 4) Mary- The story of Mary (The mother of Jesus) is interesting. She was a young lady and also a virgin. Among all the spiritual ladies/women or among all the ladies/women in Isreal, God chose Mary. God singled Mary out of them all to birth our Lord Jesus. God preferred Mary amongst others to carry His greatest possession- His Only Begotten Son. It is really a big deal then and even now to see an angel in its angelic form appear and talk to you one on one. Mary was privileged to be touched by the Holy Spirit. Mary was privileged to see and hear God's angel. Mary was privileged to carry our Lord Jesus Christ in her womb. She asked the angel questions as though she was talking to a man. Cos of Mary, Joseph was also privileged to see & hear an angel speak to him in a dream (Matthew 1 & Luke 1). Divine Favour! 5) The Disciples- 12 men who were mostly uneducated, tax collectors were singled out by Jesus to eat and drink with Him. 12 men were singled out amongst many to be Jesus's closest friends. Jesus didn't choose who men thought He will choose. He chose who He preferred (Matthew 10). Divine Favour! Divine Favour means being singled out by Jesus for an unmerited grace. You do not deserve it, yet you got it. Men cannot decide your fate. Only God can decide your fate through His favour, grace and mercy. God qualifies the unqualified. God crowns the least expected. God elevates the down casted. Whomever Jesus said will be King/Queen, will be King/Queen. Divine Favour from God makes all the difference. I conclude with Romans 9:16 "So then it is not of him that willeth, nor of him that runneth, but of God that showeth mercy". This will be your testimony when you begin to enjoy God's Divine Favour. So I ask, won't it be a great idea to ask God for His Divine Favour? If YES! is your answer, then please go ahead and ask God for His Divine Favour. ENJOY!